Every house is different, so our process will vary depending on roof type and landscaping. Listed below is our typical cleaning process. If you have existing gutter guards that are no longer deflecting debris from your gutters, we can remove and dispose of the guards at no cost. Please note that we will not re-install any dysfunctional gutter guard. If conditions are wet, debris is removed by hand. If conditions are dry, debris is removed by high-pressure air. 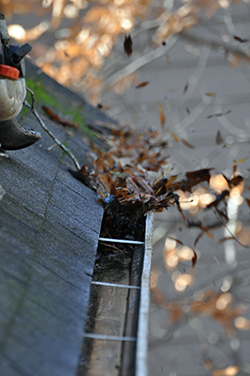 Second, using high-pressure air, we remove smaller debris such as oak tassels, seed pods, ragweed, “helicopters”, shingle grains and other debris that land in your gutter. Next, we check and clear your downspouts as needed. Then, we take all of the debris from your gutters and blow it to an appropriate location such as wooded areas or the back of your property. We will also blow off your decks and porches, sidewalks, and driveway. For an additional fee, we can bag the debris and place it by the curb for pickup. “I was referred to Shane with Lifetime Gutter and he cleaned my gutters for $65.00 and now I don't have to get on a ladder anymore and risk my life to have functioning gutters. Thank you for doing such a good job.